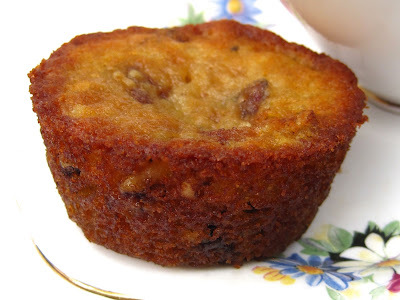 This week's recipe is a new (to me at least) type of muffin that is absolutely delicious as a breakfast treat, Rebecca's Butter Tart Muffins! 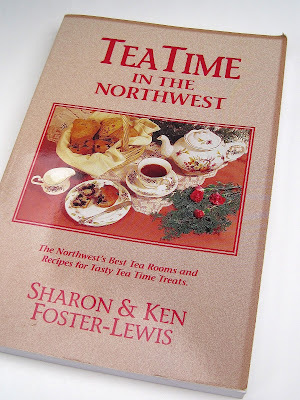 This recipe comes from a 1996 book, "Tea Time in the Northwest" by Sharon and Ken Foster-Lewis. I know it is often said that such guidebooks are dated the minute they are released, but I like to collect them anyway because they help preserve the history of tea rooms, and also because the recipes inside are timeless. The Secret Garden Tea Company, by the way, is still in business! I'd never heard of a Butter Tart Muffin before, so I was prepared for this to be something other than your usual fluffy breakfast muffin. Indeed, the low-rising, spongy muffins are very, very buttery, and with the maple syrup on top they almost remind me of pancakes in muffin form. 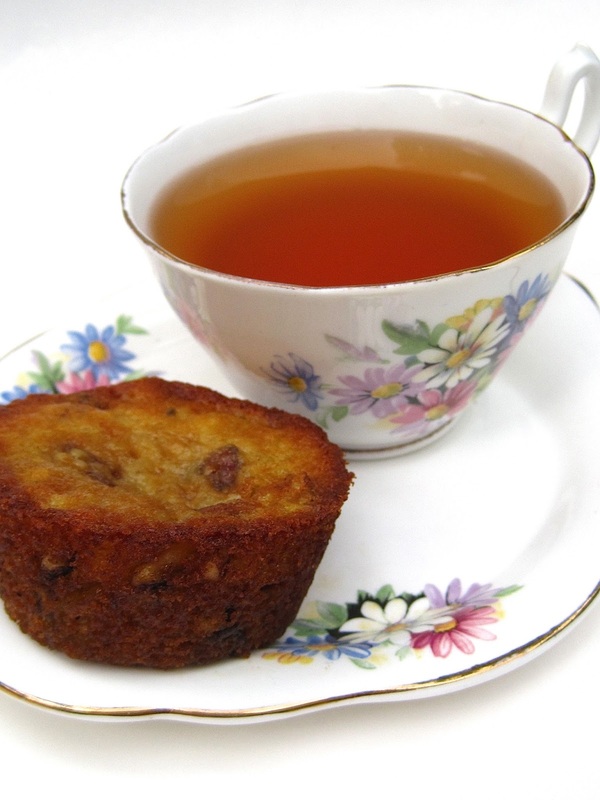 * I like raisins only in moderation, so I used a mixture of raisins, dried apricots and dried cranberries. Preheat oven to 375 degrees. In a saucepan, combine raisins, sugar, butter, eggs, milk and vanilla over medium heat and cook for about 4 or 5 minutes, just until mixture begins to thicken. Cool in the refrigerator for a few minutes. In a separate large bowl, combine flour, baking powder, baking soda and salt. Add warm raisin mixture and stir just until combined. Add nuts and combine. 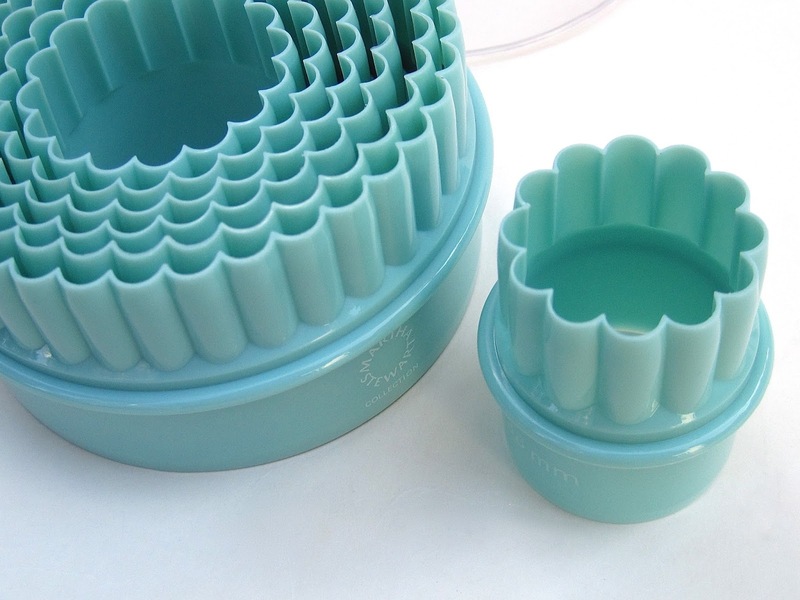 Spoon batter into muffin tins prepared with cooking spray or baking cups. Bake for 15-17 minutes, until golden on top and edges are beginning to brown. Immediately pour about a teaspoon of syrup over each muffin. Delicious served warm, and said to freeze well too. Yields 12 muffins. 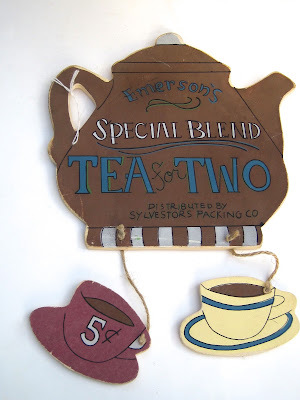 While researching the department store tea rooms of yesteryear, I learned about some intriguing non-U.S. tea rooms, those associated with the Eaton's department store chain in Canada. Several Canadian tea friends have mentioned their memories of Eaton's over the years, so for that reason alone I was happy to pick up a copy of the wonderful book "Lunch With Lady Eaton: Inside the Dining Rooms of a Nation" by Carol Anderson and Katharine Mallinson (2004, ECW Press). Here is a photo of the Grill Room of Toronto's Queen Street store in 1910. I've rarely seen a vintage photo of a tea room with people in it, and I love the ladies' hats in this one! There's plenty to entertain a tea lover in this book, including "the world's largest china teapot," which was once used in an Eaton's promotion celebrating Commonwealth Week. The real star of this book, however, is Lady Flora Eaton herself. She was the daughter-in-law of the founder, Timothy Eaton, and married to his son John. When Sir John died of pneumonia at only age 46, Lady Eaton stepped forward to lead the company, of which she had been named a director in 1921. 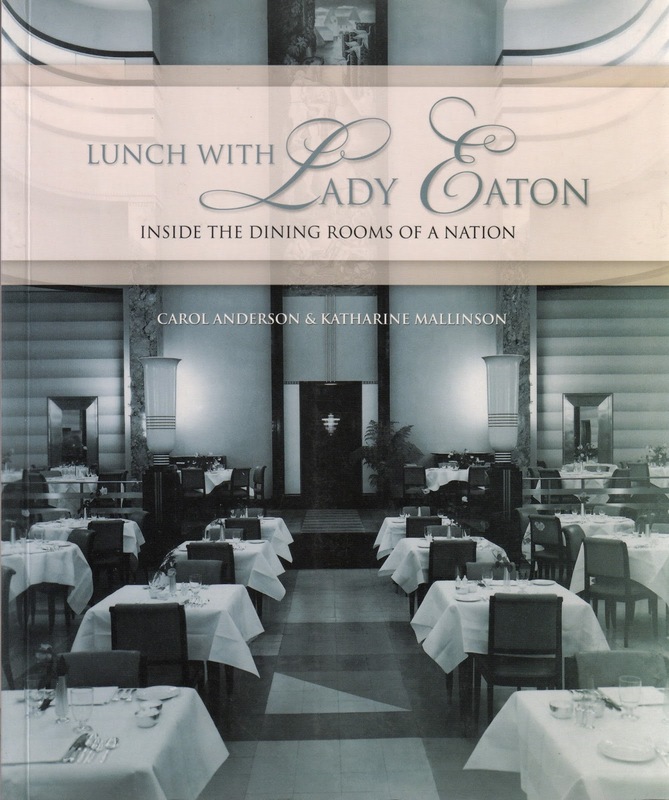 Lady Eaton took particular interest in the store's restaurants, and I greatly enjoyed reading of her focus on quality food in the various well-appointed tea rooms and other eateries. 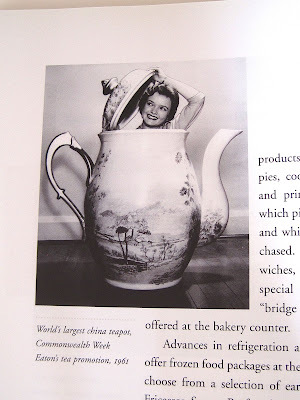 I was also amused to read that at one time, the Eaton's Hostess Shop "offered to cook gourmet meals for any number of guests, using a housewife's own kitchenware. This service included the recipe, in case guests complimented the hostess by asking for them." 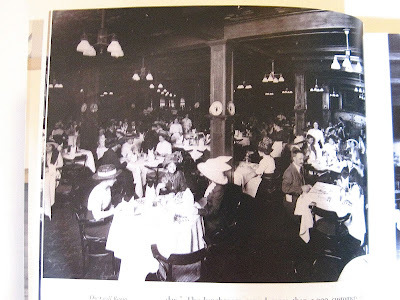 You have to wonder how many hostesses passed off Eaton's food as their own! 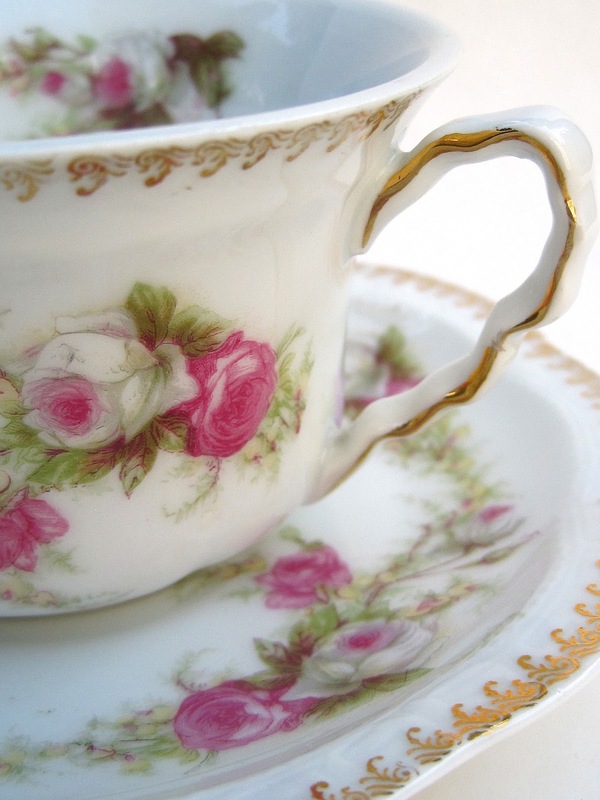 Lovers of glassware and china will enjoy reading tidbits like this: "The dishes for the Round Room were Royal Worcester china, white with four black rings around the edge. Original Round Room stemware was Fostoria glass. The goblets had a square black bottom, continuing the glass motif of the fountain." There are photos of some of the china included in the book, so of course now I'm hoping to collect a piece of it myself one day. 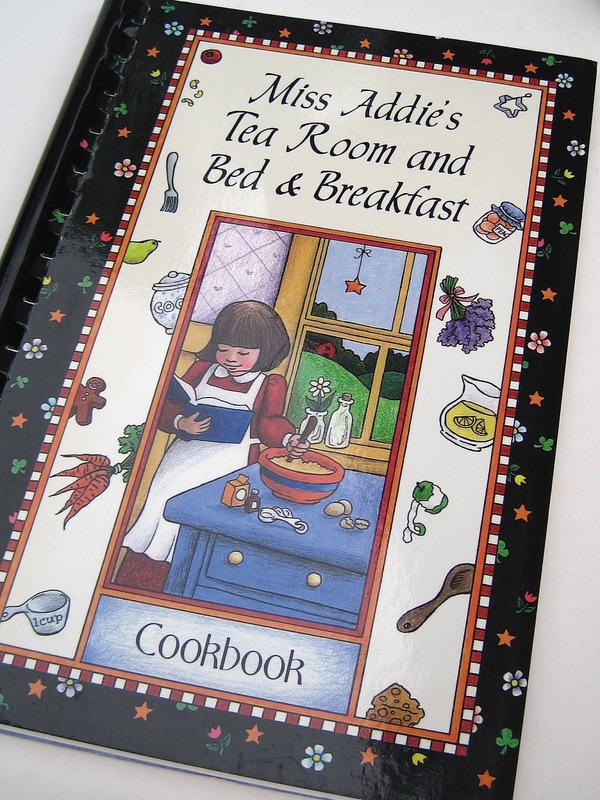 And naturally the book includes recipes, such as the once-secret recipe for Round Room Red Velvet Cake. If you're at all interested in tea room (or Eaton's) history, I definitely recommend you get a copy of this delightful book! 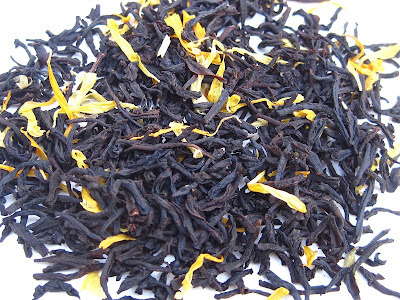 This week I'm sipping my new "Peach With Flowers" black tea from Upton Tea, and oh my, is it wonderful! Such a great peachy taste, it has! This may be the prettiest steeped tea I've seen in a while! The company describes it as "a peach flavored, whole-leaf black tea, decorated with flowers," and the flowers are marigolds. If you haven't ordered from Upton before, you will get a real kick out of seeing your name printed on the package. 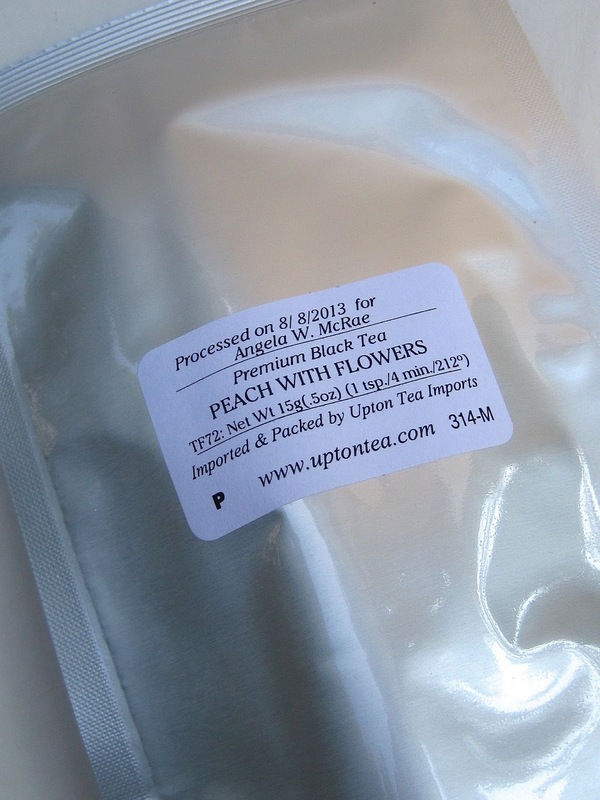 It's a small thing, but I love knowing this company packaged this tea just for me! My favorite teacups aren't always the fancy bone china ones from Royal Albert and other English makers. 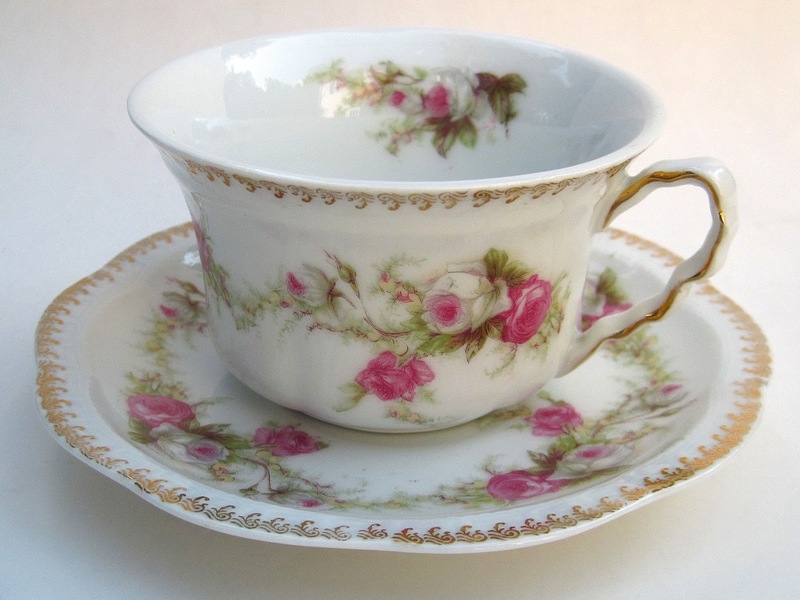 Sometimes, I prefer the softly faded, Shabby Chic look of old Bavarian teacups, and I got a good deal on one the other day on eBay: just $9.98 including shipping! I love-love-love the softly colored roses on this set marked Orleans Z.S. & Co. Bavaria. I even like the gilding on the edges, and I'm not a huge fan of gilding. 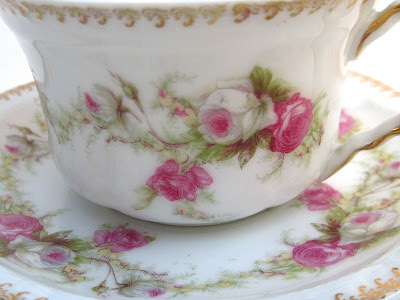 I've seen rose paintings that weren't half as lovely as the roses on this teacup. And I know I'm not alone in believing that tea just tastes better when sipped from a pretty teacup. 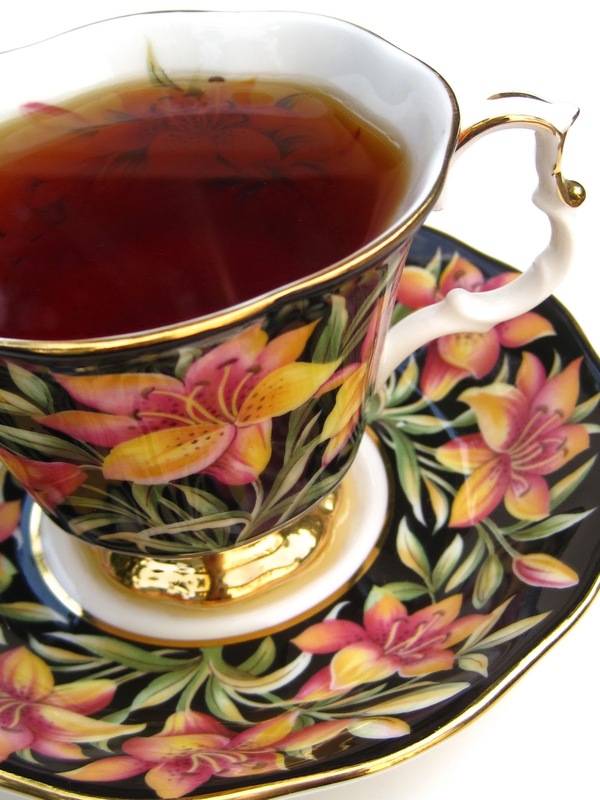 So tell me, what are you sipping your tea from today? As a rule, I do not care for malls. I do not care for the over-aggressive salespeople, I do not care to get accosted by the guy offering the free massages or cell phone plans or newspaper subscriptions, and basically, I've just become a middle-aged crank who does better ordering off eBay or visiting antique malls. So there's that. But my aunt wanted to go to the mall to shop for her birthday gifts last week, and so we went. 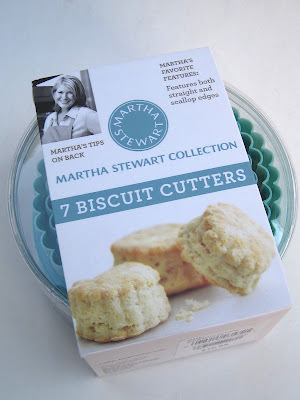 When we got upstairs in Macy's, the pretty aqua colored wares at the Martha Stewart display caught my eye, and I knew immediately I had to have a set of these $10.99 biscuit cutters, which can cut with both the scalloped and the straight edges. "Scone cutters" is how I actually think of them. When I lifted them out of the plastic container, I was amused to realize they nest in such a way that they don't fall out of the container when you open it. Nice! Seven different sizes, from small scone to big fat scone or sugar cookie. If you don't like malls either, I feel your pain, but if you must go, a visit to Macy's housewares might be in order! On Saturday, my husband humored me by coming along for a little antiquing at an old favorite antique mall, Angel's Antiques in Opelika, Ala. As you can see, I had quite a fruitful day, with my favorite find being the $10 teacup stand! 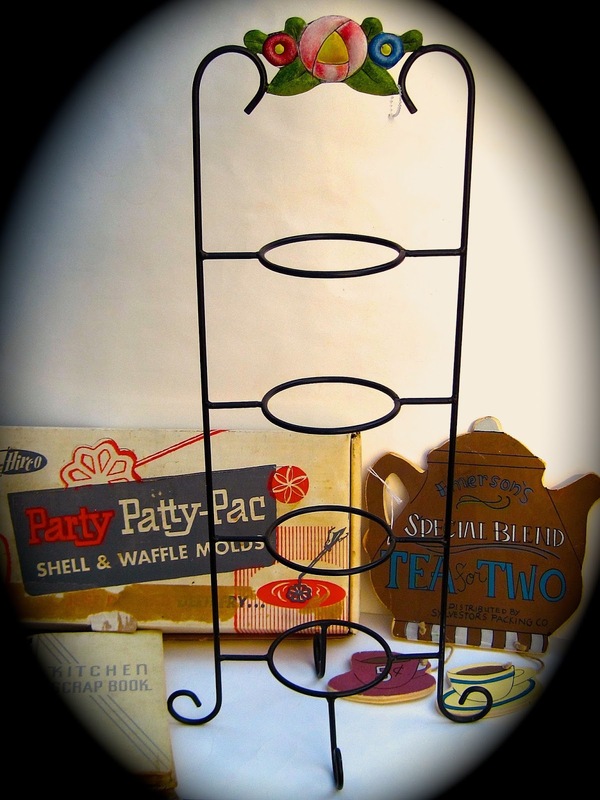 Those of you fortunate enough to own teacup stands probably know by now to hang on to them. I have been looking for one for at least two or three years now. I do see them in antique malls occasionally, but they always, always have a tag that proclaims in unfriendly lettering, "NOT FOR SALE — FOR DISPLAY ONLY." I personally think that is not very nice of the sellers, to tempt us shoppers that way, but what's a girl to do? I always look for those pretty white teacup stands, but when I saw this black one I decided a) it's a teacup stand, hoorah! b) I can paint it if I decide to and c) doesn't this look like Mary Engelbreit's designs? 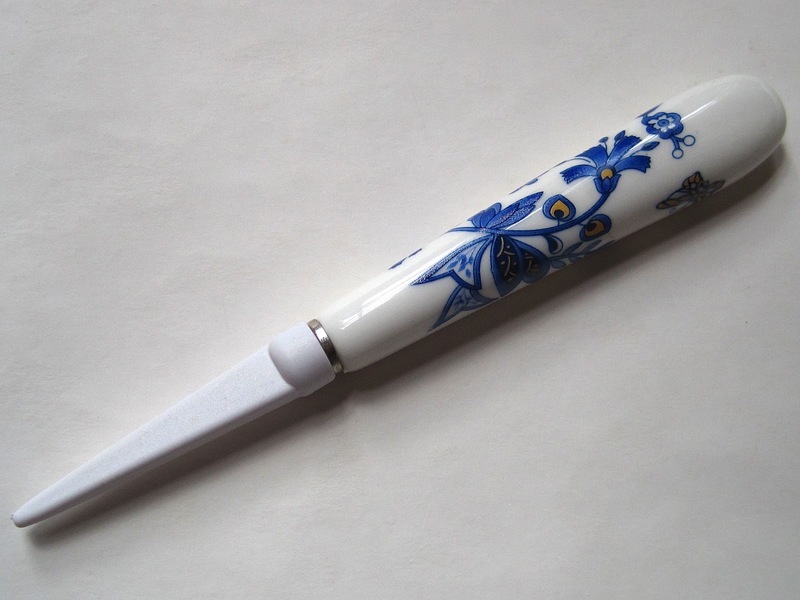 And if it's by Mary, it would be a sin to paint it. Other fun finds included this wooden wall hanging. 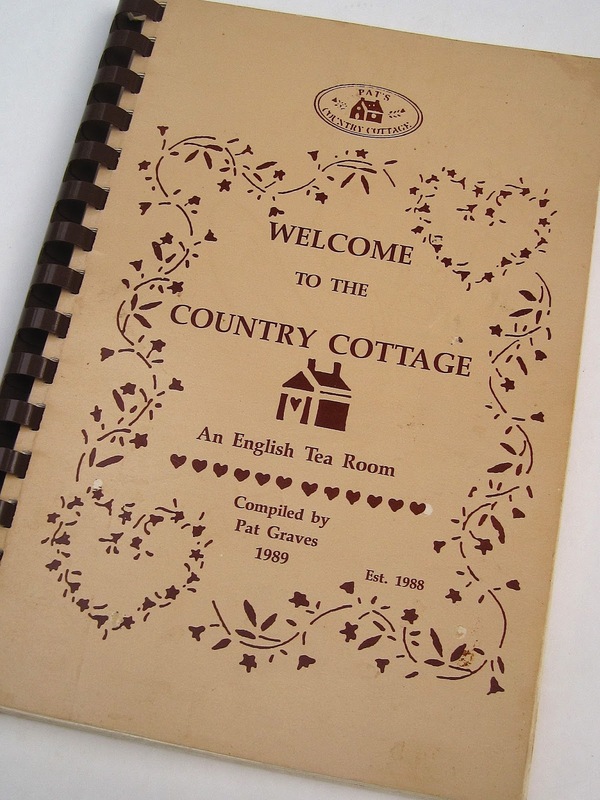 Frankly, it's a little country cutesy/rustic for my taste, but it was a very reasonable $1.50, and I thought it might serve as an accent in the tea garden one day. 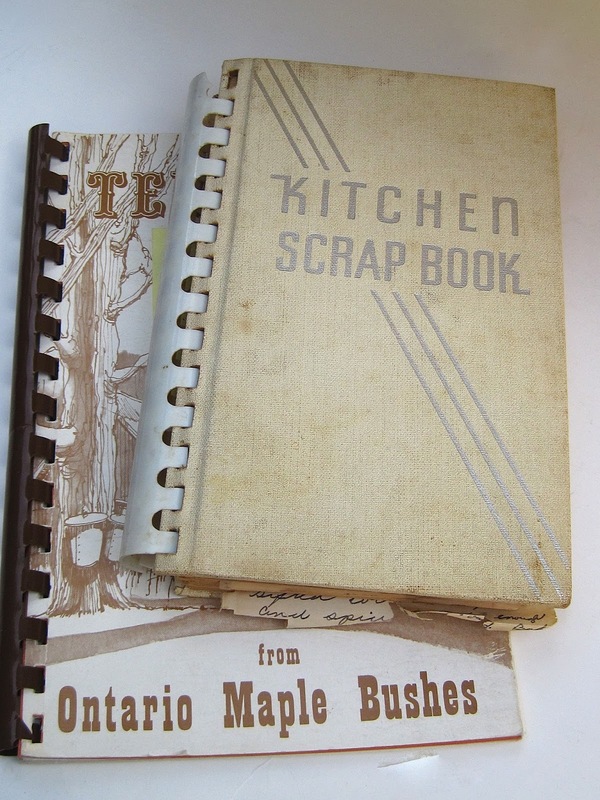 Vintage cookbooks are always fun, and here I have one full of maple syrup recipes as well as the Kitchen Scrapbook on top, which has a terrific bunch of handwritten recipes. This little book was a real treasure to me, and it'll get its own blog post somewhere on down the line, I'm sure. 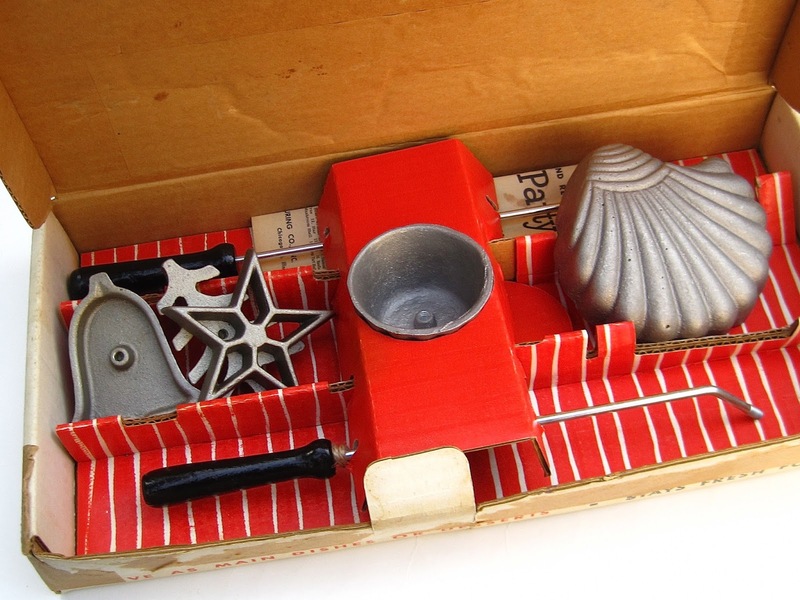 Finally, I was delighted to find a boxed set of what I call rosette or timbale makers. The Swan House in Atlanta serves its chicken salad in the flaky little pastry shells you make with these things, and I've long wanted a set. I liked the assortment of shapes that came in the box, and I was also pleased the original recipe pamphlet is there as well. Hopefully one of my tea room cookbooks will turn up a recipe I can use these with. Did you find any tea or cooking goodies this weekend? 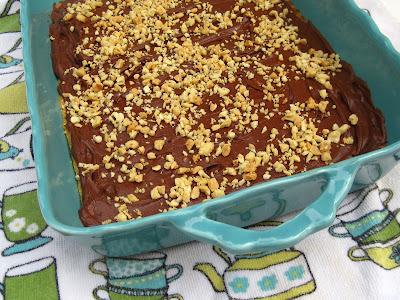 This week I was in the mood for something sweet that was easy to make and bake, and these Peanutty Bars made with a boxed cake mix were just the thing! I found this recipe in the 1989 cookbook "Welcome to the Country Cottage" by Pat Graves. This is, I believe, the fourth tea room cookbook from Arkansas that I've featured this year, so I believe Arkansas must have been a real tea room mecca at one time. 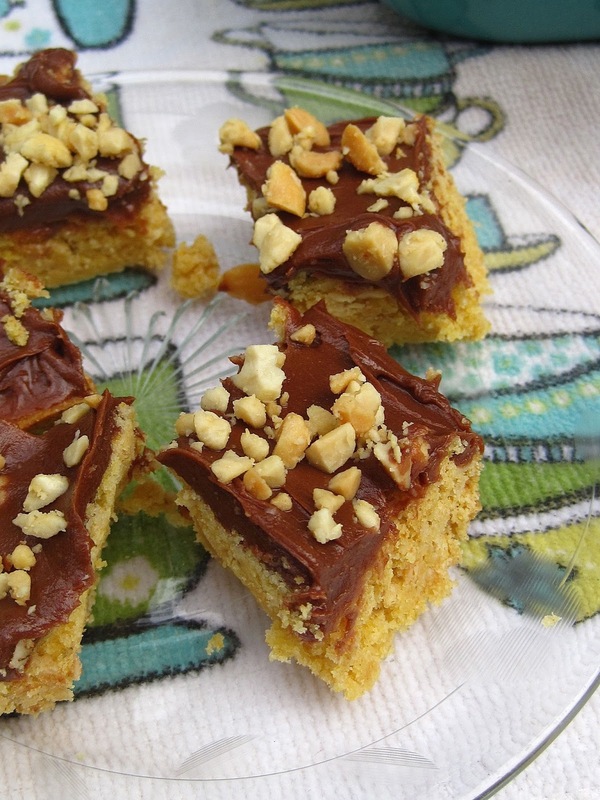 These bars took just minutes to whip up, and when I cut them into 1-inch squares, they were just the right size for a bite or two of sweetness along with the afternoon's tea. 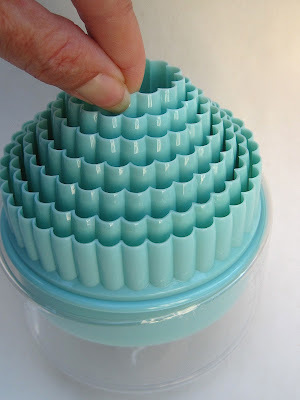 Definitely a keeper for when you need an easy-to-make sweet treat! Heat oven to 350 degrees. 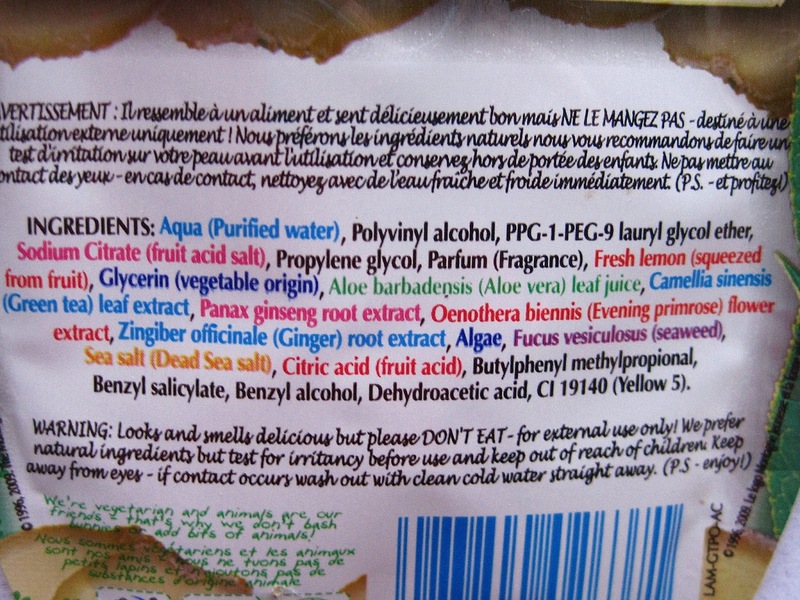 In large bowl of mixer, add all base ingredients and combine until crumbly. Press into a 13 x 9-inch pan prepared with cooking spray. Bake for about 15-20 minutes or until light golden brown. 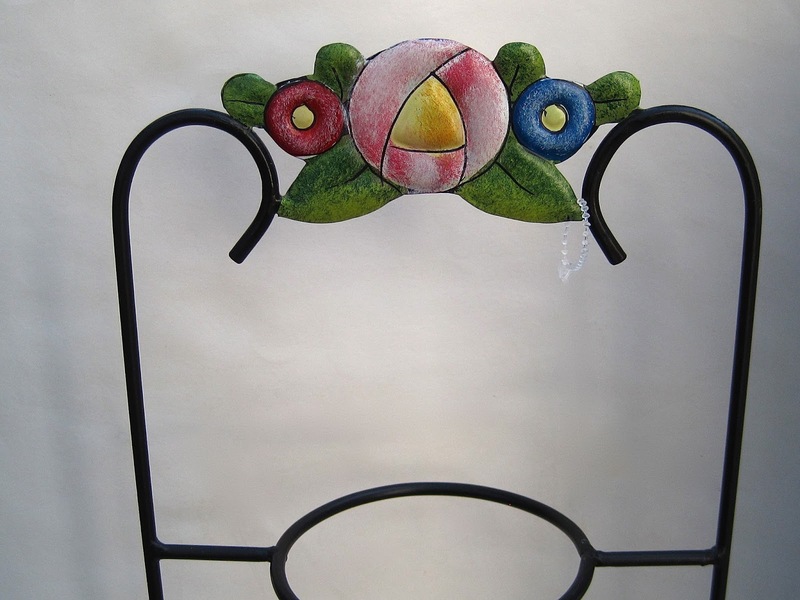 Cool completely on wire rack. In another bowl, combine frosting and peanut butter. Spread on base and sprinkle with chopped peanuts if desired. 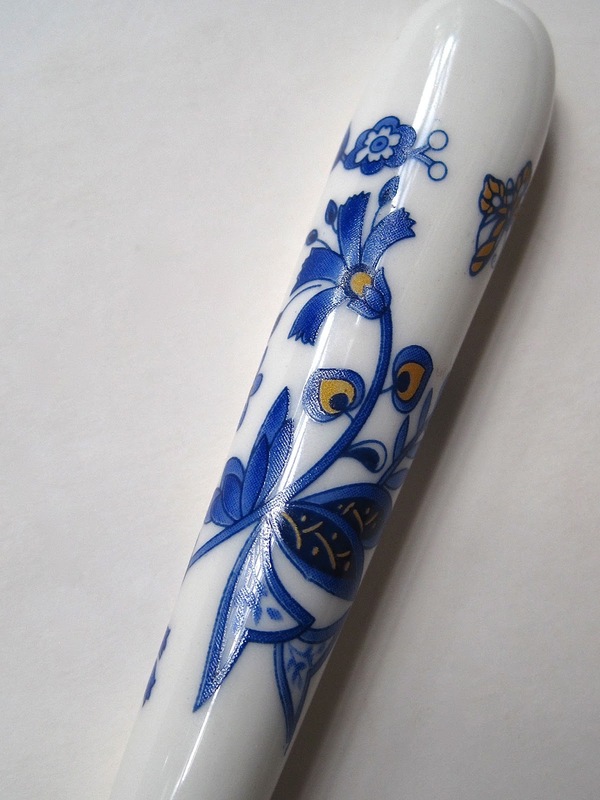 For anyone who didn't know the answer to yesterday's pop quiz, this is a puerh tea knife! 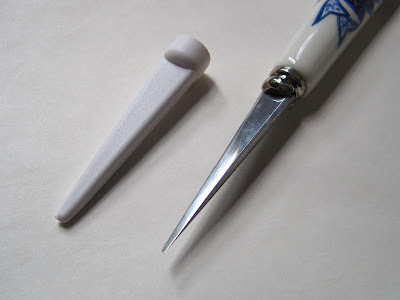 I was looking up tea knives on eBay one day — the pretty, antique silver kind you use with scones — when I came across this different kind of tea knife, and it immediately struck me that why yes, we do indeed need a "puerh knife" for breaking off bits of puerh tea, which often comes in compressed "cakes" or "nests" of tea leaves. 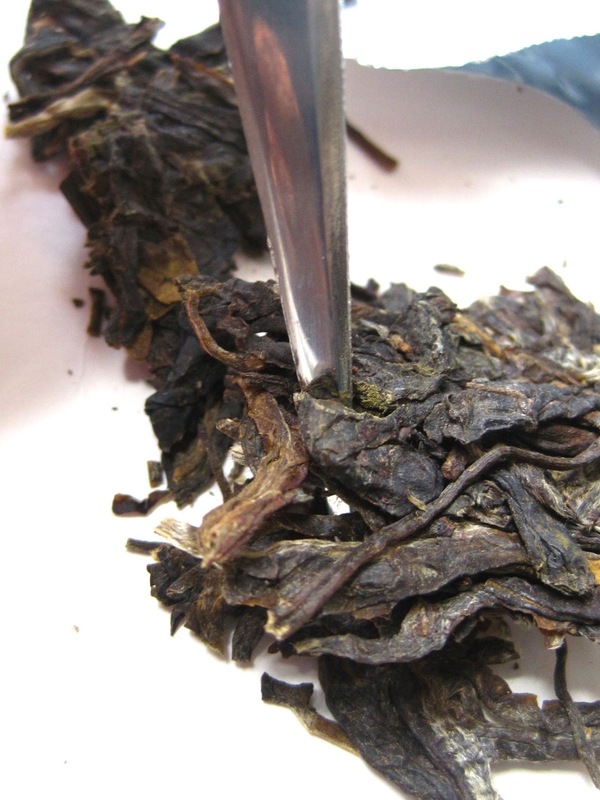 I happen to like puerh, but I do understand that this particular tea doesn't suit everyone. 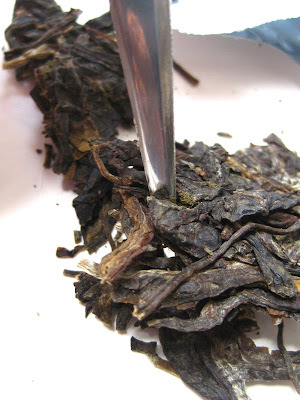 There were several different varieties of these puerh knives on eBay, including a pretty wooden one with beads dangling from the handle, if that's more your style. 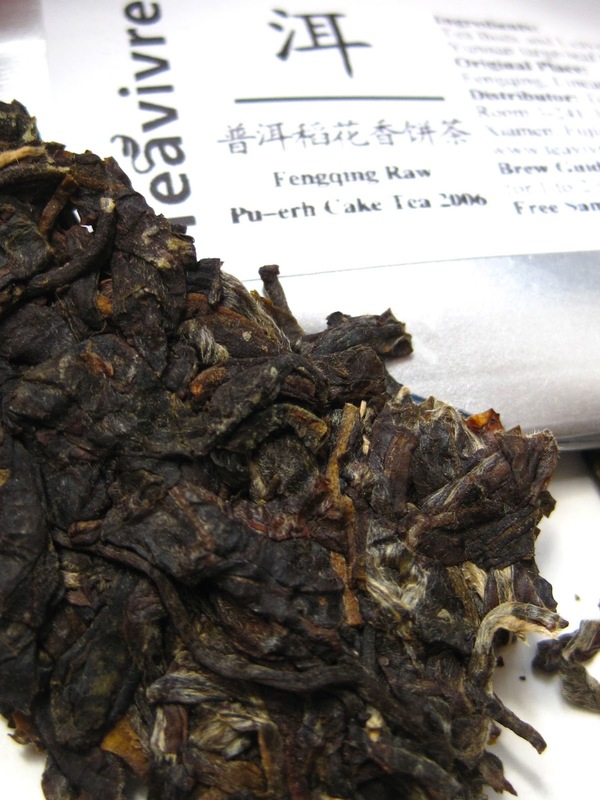 As you can see, once the tea is steeped the leaves look like any other tea leaves you've steeped yourself. This puerh is a Fengqing Raw Puerh Cake Tea sample from Teavivre, and you can see what the entire cake looks like here. 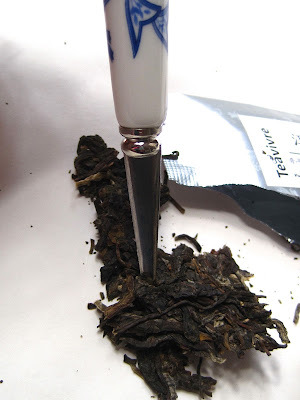 So if any of you have some little nests or cakes of puerh tea sitting around, I highly recommend getting yourself a puerh tea knife! Pop quiz: Name this tea accoutrement! 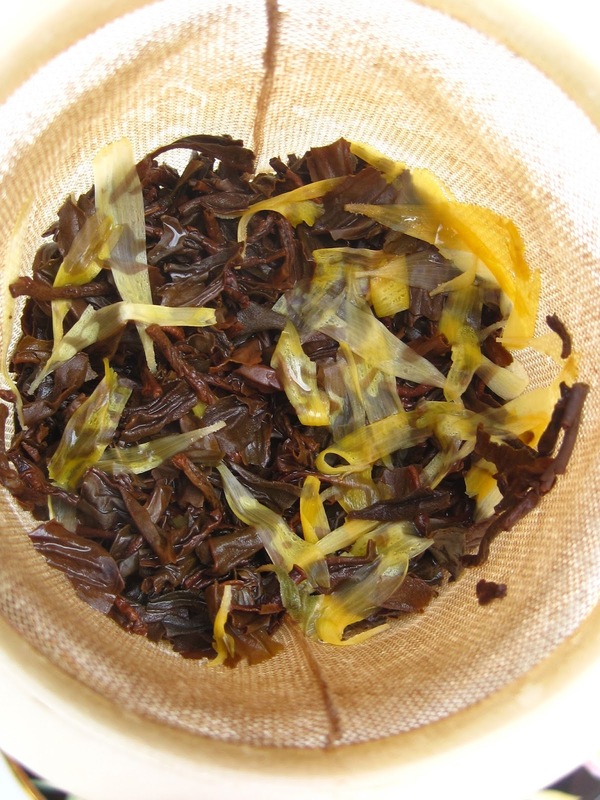 Oh, friends, I know it's not nice to kick off the morning with a pop quiz, but I've been dying for my new tea accoutrement to arrive so I could see if any of you know what this is! I confess, when I first saw this I didn't have a clue what it was. I was looking for something else on eBay one day when this popped up in my search results and I thought, "Huh? What on earth?" But then I read some more, and I discovered that while I did not have this particular tea tool, I actually *needed* it! Really. I did. So who knows what this is? Tomorrow I'll show you what it's for and the tea it's associated with! 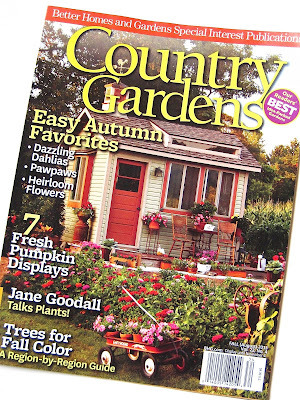 Country Gardens is one of my favorite magazines, and it's always a happy day when this publication lands in my mailbox. 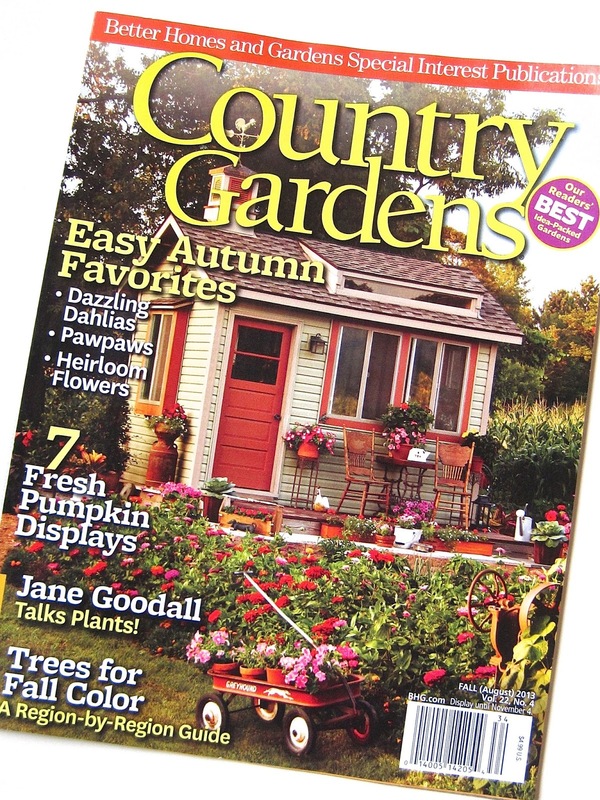 The Fall 2013 issue is a great one, with some unique new ideas on decorating with pumpkins that you fall lovers should really check out for autumnal tea tables! 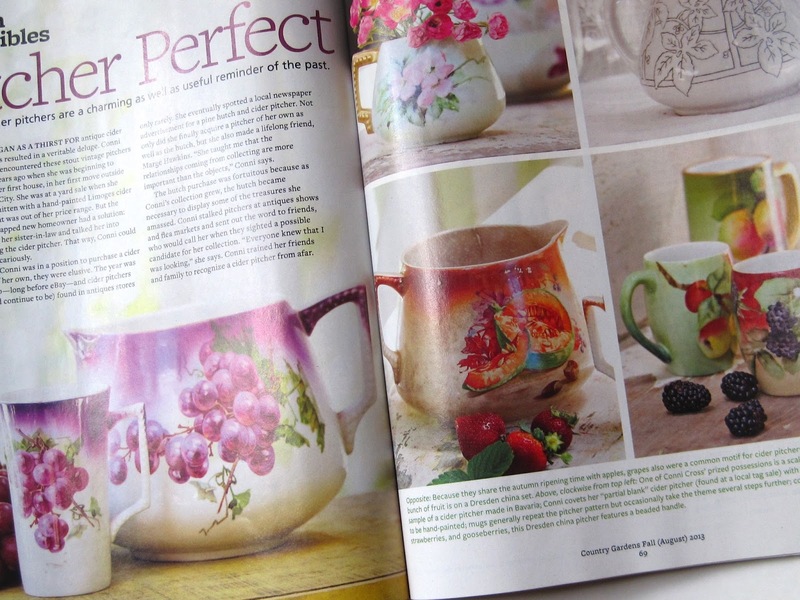 But what most intrigued me in this issue was the feature on antique cider pitchers. Frankly, I'd never heard of cider pitchers, but I *had* seen these short, squatty pitchers in antique malls and wondered what they were for. Now I know! Writer Tovah Martin says, "Unlike relatively tall and svelte lemonade pitchers, the cider-holding version is typically short and rotund — shaped somewhat like a teapot but with a wider mouth and without the lid." The article features collector Conni Cross (who seems anything but cross!) and tells how she came to acquire so many of these pitchers that for the past 20 years, when she uses them at Thanksgiving she's never had to use the same one twice. I also like what the article says about the history of these wares: "Cider pitchers were part of a phenomenon in the late 19th and early 20th centuries known as 'home art,' in which undecorated ceramics were marked on the bottom with a stamp from the manufacturer … and then sent to factories or individuals to be hand-painted by 'paintresses.' Although men were also porcelain painters, it was one of the few careers open to women at the time." I think we'd all probably agree that these "paintresses" did a lovely job. 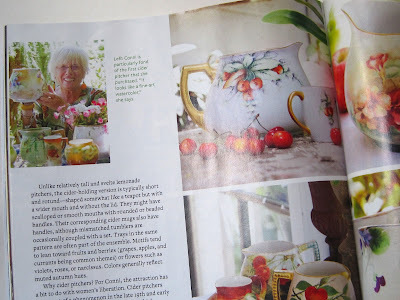 And now, of course, I'm hoping to score a cider pitcher for myself one day! Do any of you happen to own a cider pitcher? 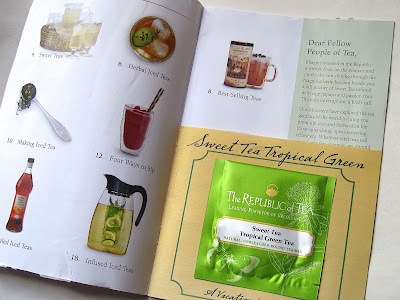 Recently I came across an ad for Republic of Tea teas, and it reminded me I hadn't received a copy of their catalog in a while. I went to their website and ordered one. The ROT catalog is always a classy affair, with elegant photography and a nice, clean layout. 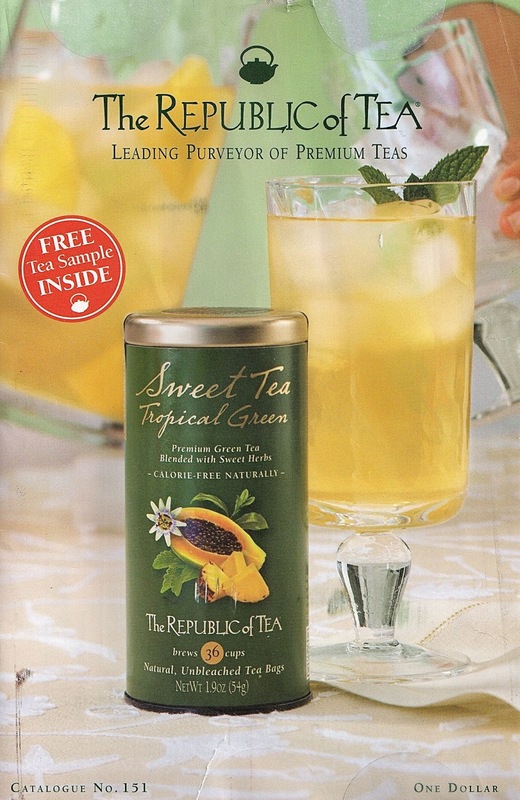 I also love that this catalog always arrives with a free tea sample tucked inside. This time, it was some of their new Sweet Tea Tropical Green Tea, which was simply terrific! 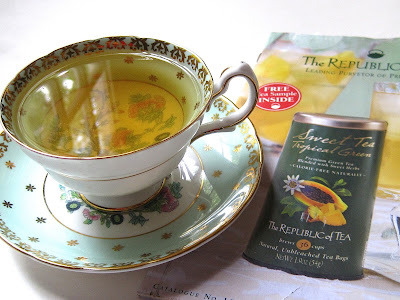 I immediately was struck by how very sweet this citrusy tea tasted, so I had to visit the website, where I discovered its ingredients are "Fine Green Tea, Korean Hydrangea serrata leaves, stevia leaves, blackberry leaves, licorice root and natural tropical flavors." 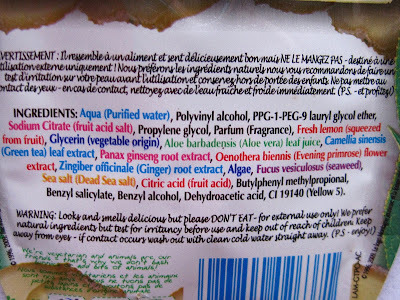 I'm betting the sweetness is from the stevia, and I was also delighted to learn it contains hydrangea serrata leaves, because I have that very hydrangea growing at my house. (Go here for a photo and to learn more.) And if you'd like a Republic of Tea catalog and sample for yourself, go here and scroll down to the bottom to order! This summer has ended up being quite a busy one, and I've noticed when I'm out running errands I like to go in stores I can zip in and out of in a hurry. 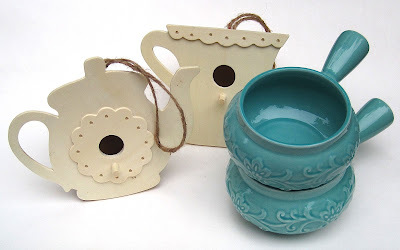 Happily, my local Michaels falls into this category, so a quick trip there last week yielded some bargain goodies I was delighted with, including unfinished teapot and teacup birdhouses for 59 cents each, and some handled soup bowls which I think are just lovely! The birdhouses were at the end of an aisle with some clearance goodies. The teapot one is about 6 inches tall, 7-1/2 inches wide. 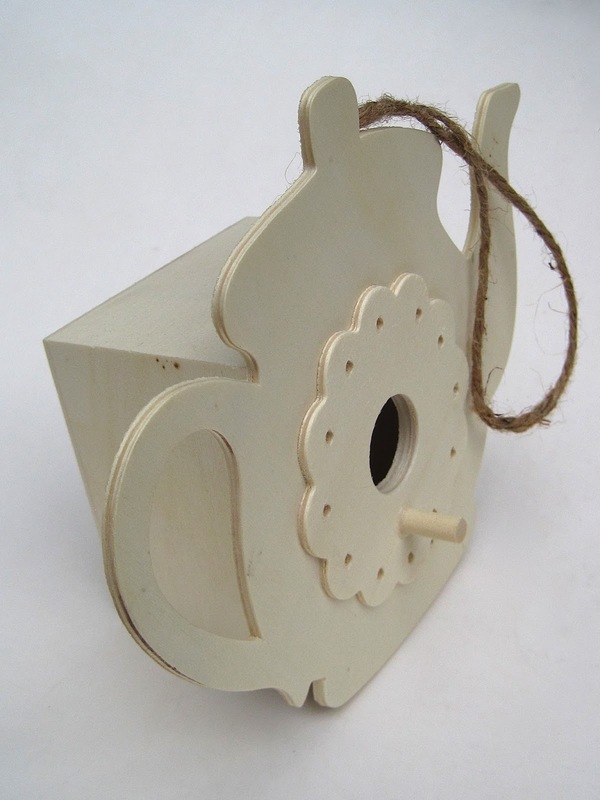 It and the teacup birdhouse will make great fall or winter craft projects, I think. Should I paint them? 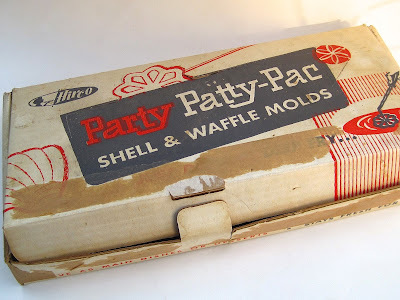 Decoupage them? Use them as decor indoors? What would you do? The soup bowls, regularly $6.99, were on sale for $3.49, plus I had an extra 10 percent off sale coupon, which made them a bargain too. 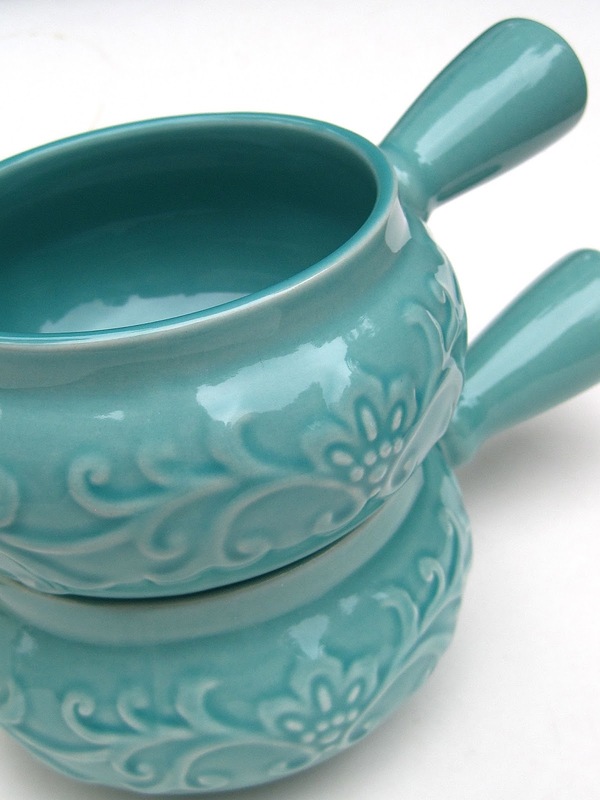 I got the aqua blue ones so they can go in the beach house some day (like, after I get one), and you can probably look for a tea room soup recipe to be featured in the new bowls very soon! I love to come across casserole recipes in tea room cookbooks. Why? Because I know they'll typically be something simple, delicious, and suitable for both the afternoon and evening mealtimes. This week, I was drawn to a tuna casserole recipe I found in a sweet little 1998 cookbook from a tea room in Oklahoma. 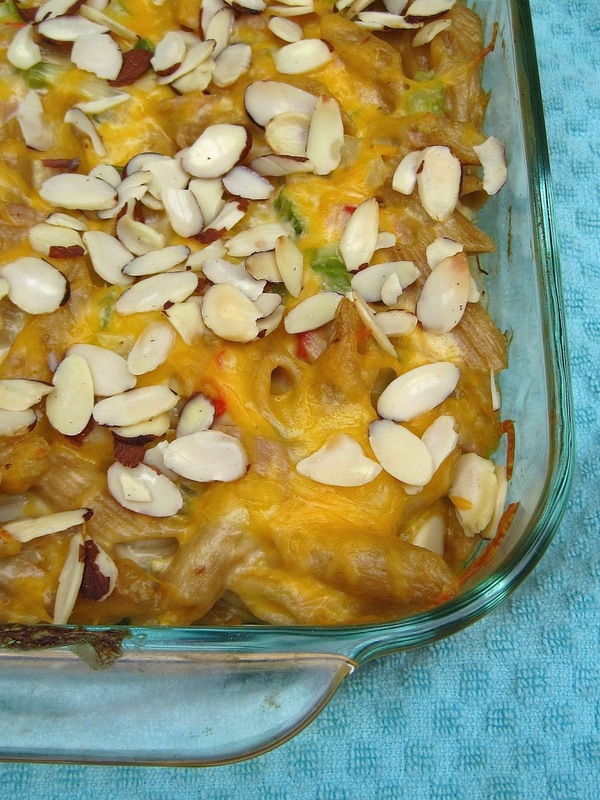 This casserole was super easy to whip up, and I adjusted the recipe below by using a 12-ounce box of noodles, two (5-ounce) cans of tuna, and a bit more of all the veggies. That way, I got two 9x9-inch casseroles, one for now and one for later. 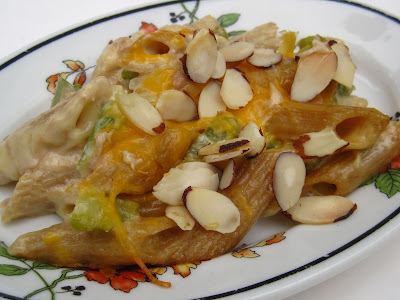 I used whole wheat pasta, and this was quite a delicious lunch dish, especially with those crunchy almonds and the cheesy soup mix. Yum! Cook noodles according to package directions and drain. In small saucepan, sauté the celery, onion and green pepper in butter. In a large mixing bowl, combine noodles, tuna, mayonnaise, vegetables and salt. In a sauce pan, blend soup and milk over medium heat. Add cheese and combine until melted. Add soup mixture to tuna/vegetable mixture and combine. 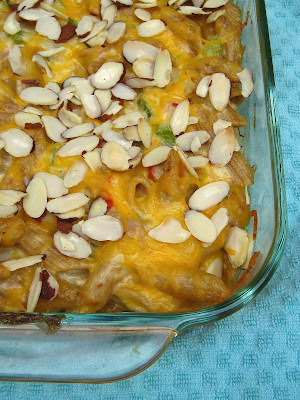 Pour into a 13 x 9-inch casserole dish, top with almonds, and bake at 375 degrees for 20 minutes. Ms. Hennes and Cynda P.! Congrats! 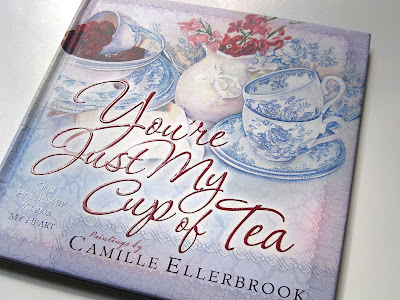 If you'll send me your snail mail addresses via the e-mail button at right, I'll get these headed your way so you can start totin' in (tea) style! As I am writing this blog post, my face feels softer and smoother than it has felt in years! 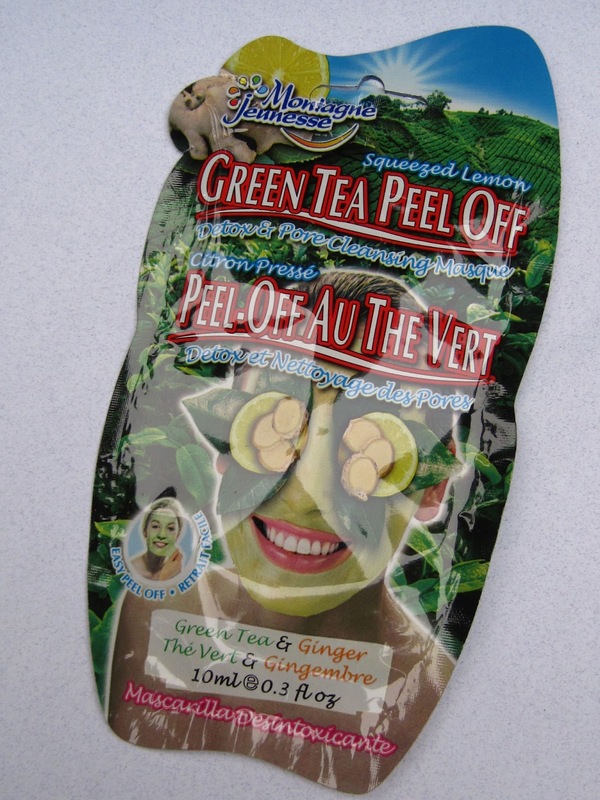 I discovered a green tea peel-off mask at Walmart the other day, and I think the next time I'm there I will stock up on this wonderful and cheap ($1.37) little luxury from Montagne Jeunesse in the UK! Perhaps I needed it. I was tossing some Kroger receipts when I got home the other day and discovered the store in Fayetteville had given me a senior discount! Ack! But then I checked a receipt from the Newnan store and saw they did *not* give me the discount, and I was so happy. "Let me get this straight," said my husband. "You're happy because you got charged more money at the store in Newnan?" "That's right," I said. I know you friends understand. I'm not at all vain about the fact I'm 49 and pushing 50, but sheesh, let's not rush the senior thing, okey dokey? 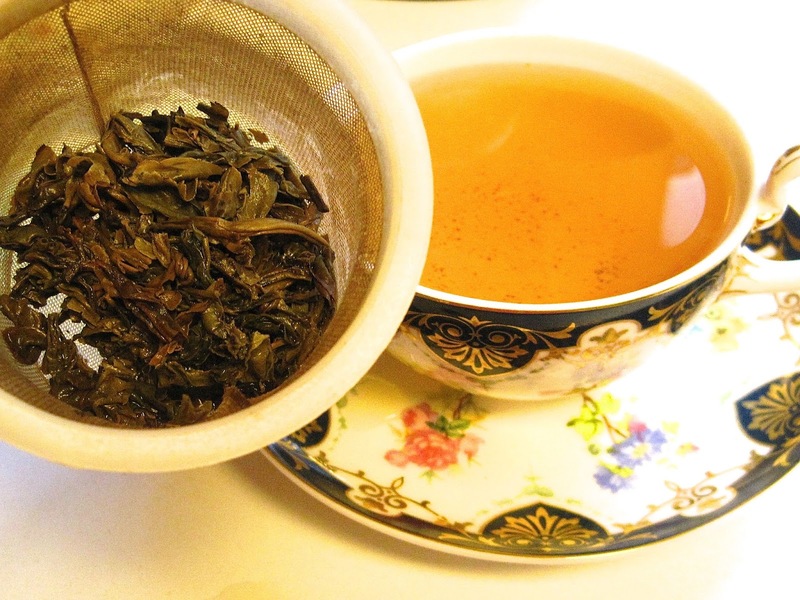 Anyway, a little facial treatment is good for both body and soul, and I was delighted this one actually contains camellia sinensis leaf extract. It has a nice, pleasant smell too. I hadn't used a peel-off mask in years and had forgotten how much I enjoy them! Maybe I'm weird, but I love scrunching up my face as the mask dries and feeling that tightness that lets me know the mask is drying. Twenty minutes after application and I was sufficiently scrunched up that I knew it was time to peel away. My skin felt truly wonderful, and this is a mask I will definitely be using again. 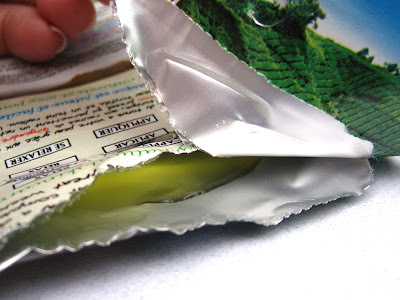 I just wish I had a big tube of it instead of a single-use packet! Lady B's Time for Tea blog recently featured a post about tea-themed books, and one I had never heard of before was "You're Just My Cup of Tea" with paintings by Camille Ellerbrook. These paintings are totally new to me, and I loved them immediately! 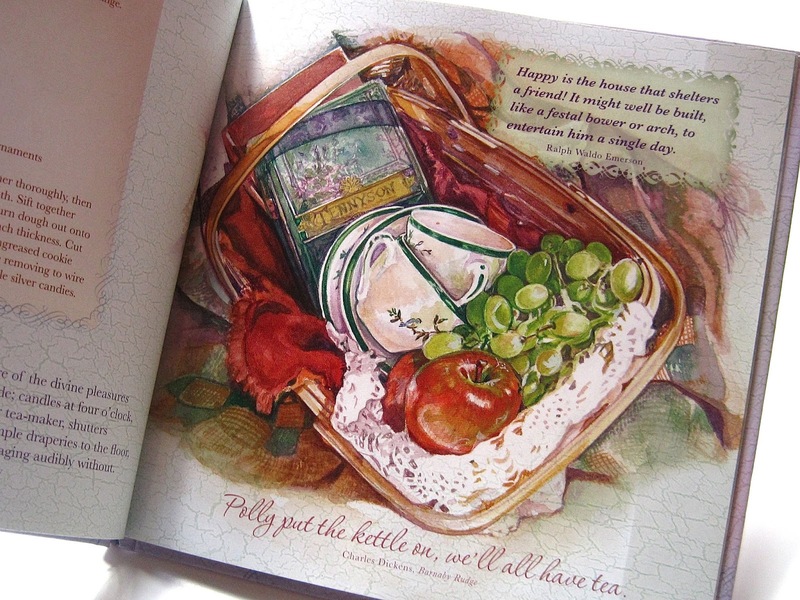 This charming painting made me think of all you tea friends who enjoy picnic-style teas! And unless I'm mistaken, that's Spode's classic Christmas china in the basket, isn't it? And of course silver tea services always seem the height of elegance to me, so I enjoyed this painting as well. 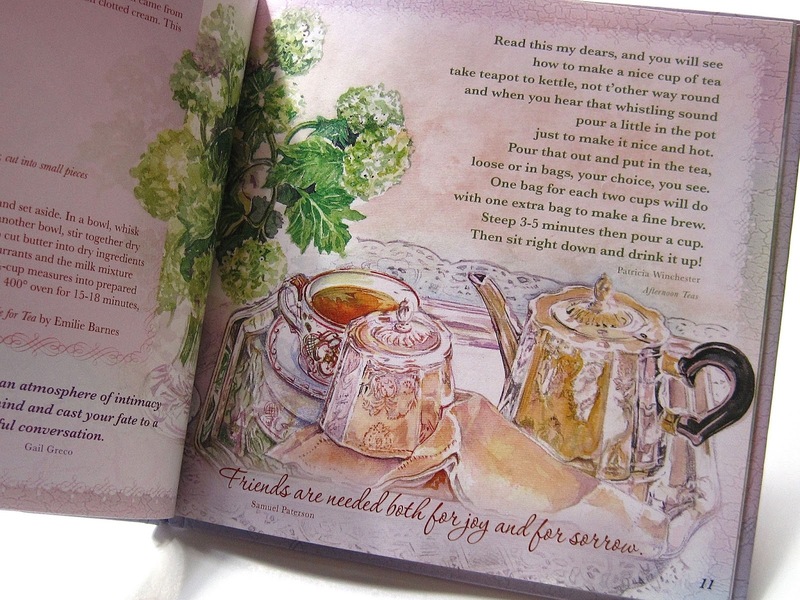 Unlike a new book I featured earlier this week, this one has been out a while, since 2006, and I greatly enjoyed reading the tea quotations, excerpts and recipes, but I especially enjoyed "meeting" a new tea artist!